Disturbed about the content and quality of physicist Steven E. Jones' 9/11 work, Drs. Morgan Reynolds and Judy Wood conducted a peer-review. This review covers ten major issues which include demolition of WTC 7, demolitions of WTC 1&2, evidence for high-energy explosives, thermite, glowing aluminum, No Big Boeing Theory (NBB) and other issues. In the "truth movement," it is vital that we police our own. If we don't, the defenders of the OGCT certainlly will. You can be sure that it will get mighty ugly when defenders of the OGCT find major errors. This is the purpose for having research peer reviewed. Four years after the event, a Brigham Young University physics professor, Steven E. Jones, suggested that the destruction of the World Trade Center skyscrapers was not caused by impact damage and associated fires but by pre-positioned explosives. Jones paper caused a stir because of his credentials and apparent expertise in physics, mechanics and chemistry. Jones is the only full professor in physics at a major university who has publicly expressed skepticism about the official 9/11 story. Jones background includes research in the controversial area of "cold fusion," but his work in muon-catalyzed fusion did not seem to produce any significant energy and hence proved a dead end, in contrast to the promising electrochemically-induced process. Within weeks of Jones arrival on the 9/11 scene Dr. Jim Fetzer, a philosophy professor at the University of Minnesota-Duluth, founded a new organization? Scholars for 9/11 Truth?and invited Jones to become co-chair, effectively second in "command." The society grew rapidly to 300 members and Fetzer and Jones made notable strides in publicizing shortcomings in the official 9/11 story. Steven Jones star continues to rise: "Now he [Steven E. Jones] is the best hope of a movement that seeks to convince the rest of America that elements of the government are guilty of mass murder on their own soil," writes John Gravois in the Chronicle of Higher Education, June 23, 2006. Canadian chemist Frank R. Greening says members of the 9/11 conspiracy community "practically worship the ground (Jones) walks on because hes seen as a scientist who is preaching to their side." Among other activities, Jones initially was responsible for the scholars discussion forum and he and Judy Wood instituted a "peer-reviewed" Journal of 9/11 Studies. Jones appointed the advisory editorial board, later Kevin Ryan as co-editor and chose the "peers" to review manuscripts. Peer-review normally boosts the prestige of academic articles because professors within the same discipline review manuscripts but in this case there is little or no such review, even when offered. That fact convinced Wood to resign. The steep ascendant of one scientist puts many of the 9/11truth movements eggs in one basket. The question is, are we being set up for a fall? The time for applauding Jones stepping forward has passed. Events force us to take a hard look at Jones growing influence on 9/11 research. Collectively we are engaged in a struggle to expose the governments lies about 9/11. The physical sciences and analysis are key to this project. The only investigation worthy of the name has been conducted on the internet by researchers like Thierry Meyssan, Gerard Holmgren, Jeff King, Rosalee Grable, Kee Dewdney, Nico Haupt, Killtown, and "Spooked" who proved no Boeing 757 went into the Pentagon, flight 93 did not crash in the designated hole near Shanksville, PA, and the WTC towers were demolished by explosives. Demolition at the WTC was proven fact long before Jones came along, but he initially said that it is "
" His subsequent concentration on issues like steel-cutting thermite and experiments with newly-discovered materials from unofficial sources allegedly from the WTC site have undermined confidence in demolition. Jones neglects laws of physics and physical evidence regarding impossible WTC big plane crashes in favor of curt dismissal of the no-big-boeing-theory (NBB). He relies on "soft" evidence like videos, eyewitnesses, planted evidence and unverified black boxes. When others challenge how aluminum wide-body Boeings can fly through steel-concrete walls, floors and core without losing a part, Jones does not turn to physics for refutation but continues to cite eyewitnesses and videos, thereby backing the OGCT. Figure 3(b): Loss of a chunk (sizable section) out of this tower would be inconsequential. Figure 3(c): If the tower is viewed as a "towering tree" and the Keebler Elves carved out a residence, no measurable weakening would occur. If their cookie oven set fire to the tree, it would be inconsequential. On 9/11 issues where the case is proven and settled, Jones confounds it. On controversies with arguments and evidence on both sides like NBB, he conducts no physical analysis and sides with OGCT. The world asks, what energy source could have transformed 200,000 tons of steel-reinforced concrete into ultra-fine particles within seconds, suspended in the upper atmosphere for days while leaving paper unharmed, hurling straight sticks of steel hundreds of feet, incinerating cars and trucks for blocks, and leaving nary a desk, computer, file cabinet, bookcase or couch on the ground? Jones seems to reply, "Superthermite." In total, 2,700 vertical feet of building, containing nearly 10 million square feet of floor space, were reduced to a tangled, smoking, burning heap less than 200 feet thick." Figure 6(f): An earthquake-induced collapse in Pakistan suggests how much rubble and how little dust should have been at Ground Zero if the governments gravitational collapse story were true. "[A good option] is to detonate the columns so that the buildings sides fall inward," Jones writes, "
all of the rubble collects at the center of the building"[pdf (7/19/06) p. 19].". Jones seems untroubled by the meager rubble from the massive cores. If all the steel had fallen to ground zero, it would have formed a steel block at each tower base approximately 200x200x10.2 high. 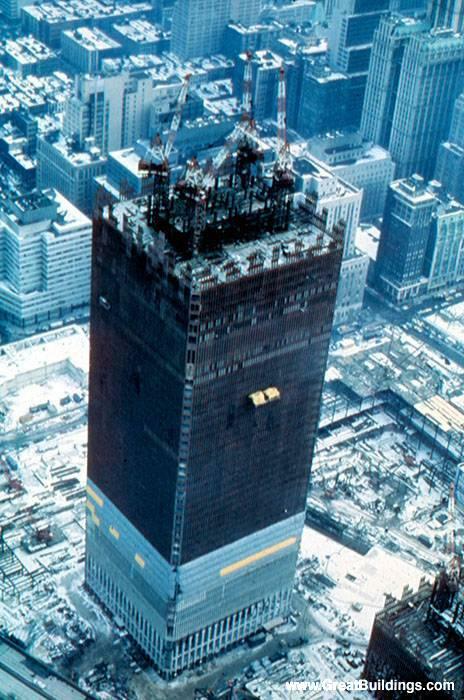 If all the concrete had fallen to ground zero, it would have formed a block at each tower base 200x200x56.1 high. Together they would total 66.3 feet tall of pure steel and concrete or over five stories with no air or other debris. This calculation takes no account of over 1,000,000 square feet of aluminum cladding, 600,000 square feet of thick window glass, machinery (including 200 elevators in each tower), wall board, ceiling material, water and water systems, a few million miles of wiring, office equipment and furniture, etc. This statement raises two problems: first, Jones gives credence to the loony OGCT that "19 young Arabs acting at the behest of Islamist extremists headquartered in distant Afghanistan" were involved or caused 9/11. It makes no sense to embrace parts of the governments unproven story without independent proof. If a scientist falsifies his data, his career is over. Why not the same standard for government liars? Second, with so many compelling facts like near free-fall speed, symmetric disintegration in their own footprints, almost no concrete left, and many others, it is folly to rely on molten metal as the strongest evidence for demolition, especially flowing from windows in manipulated videos. In downgrading the importance of free-fall speed Jones wrote on July 2, 2006,"
stronger arguments are growing, IMO." There is no stronger argument for demolition than near-free-fall speed. Over a year before Jones appeared, Derrick Grimmer, a Ph.D. physicist from Washington University-St. Louis and member of the Scientific Panel Investigating Nine Eleven (SPINE), posted a scientific article about possible use of thermite to melt sections of the WTC core. Jones does not cite this work but begins with the WTC study by the governments National Institute of Standards and Technology (NIST) and its videos and pictures of liquid metal pouring from a window of the WTC 2. Jones does not challenge these data though they appear to violate the laws of physics. Where would heat sufficient to melt "huge" quantities of metal come from, allow it to collect in large reservoirs and pour along unspecified (irrigation) channel(s)? And how could thermite, which is little more than a cutting torch, melt mass quantities of metal [see Figure 14(b) and (c)]. After a confrontation, Jones admitted that Andrew Johnson spliced the videotape but they fail to tell us what was spliced to what and why and what the effect is. NIST claims the pictures and videos were from Reuters and WABC-TV but are they real? They look fake. Who took the pictures? What was the chain of custody? Is there evidence of photoshopping?
" NIST does not say if the adjustment was uniform, confined to a particular window or what. The images have been tampered with and therefore are useless as data to scientists. Figure 10(b): Jones edited version of the photo ignores the NIST alert that "the intensity levels have been adjusted." He has also used spliced videotapes without identifying they were tampered with. Figure 10(c): The alleged flow appears in a different window. the approximate temperature of a hot metal is given by its color, quite independent of the composition of the metal. (A notable exception is falling liquid aluminum, which due to low emissivity and high reflectivity appears silvery-gray in daylight conditions, after falling through air one to two meters, regardless of the temperature at which the poured-out aluminum left the vessel. Aluminum does incandesce like other metals, but faintly so that the conditions in the previous sentence falling [sic] liquid aluminum will appear silvery-gray according to experiments at BYU [Jones references himself])." We have no explanation for why Jones would insist, contrary to evidence outside BYU, that flowing aluminum does not glow at high temperatures in daylight conditions. This color chart shows that all pure metals are the same color at each temperature. Figure 12(c): This picture appears to have been taken indoors, in a dark room. If that is "daylight" outside the window, it clearly is not shining in through the window as there are no shadows. In addition, the pot in this picture is more out of focus than anything else in the picture, which would imply a slow shutter speed. It appears that the technician is shaking the pot in an effort to get the aluminum out of it. Fast shutter speeds are used in bright daylight. If the motion of the pot is captured on camera, can this really be considered to be "in daylight conditions?" If the anomaly observed in the pictures of the south tower is even a real phenomenon and if it is iron, Jones favored interpretation, it must be above 1538°C. To rule out molten aluminum in these south tower pictures,aluminum would have to be heated above 1538°C for a valid comparison. Here is an analogy: who would conclude that a liquid at 25°C (room temperature) cannot possibly be water because we all know H2O is a solid at -5°C? No one. Or, is Steven Jones going to rule out "water" as the liquid because "water" is a solid at -5°C? Compare apples to apples, oranges to oranges, one metal to another under the same conditions. In the case of an aluminum alloy, it only takes about 600°C to become liquid. We can see that the aluminum pictured at BYU is nowhere near 1538°C because it is solid, it is not flowing, the container and its handle do not glow and flimsy gloves offer plenty of protection. Notice the steam coming off the pot that we do not see in Figure 12(a). Aluminum does not remain "silvery" at elevated temperatures. Note that the emissivity of Aluminum increases with temperature. Figure 13(f): 99.7% pure aluminum at approximately 1,000° C (Wood/Zebuhr). Figure 13(g): Aluminum and its tungsten boat glow approximately the same, illustrating that the two metals possess similar emissivity (Wood/Zebuhr). Tungsten glows in daylight conditions (turn on your porchlight at noon) and is used in light bulbs because of its high emissivity. Al converges on tungstens emissivity at high temperatures. There is no reason to eliminate aluminum as the liquid flowing from the south tower based on alleged differences in emissivity among Al, W, Fe at temperatures of 1500°C and higher. with controlled demolitions which did not use thermite, nor with building fires, nor with thermal lances," writes Jones, "Huge quantities of the stuff." Jones asserts "that much thermite was used to bring the buildings down" [pdf (7/19/06) p. 62]." but if proven wrong, there is little or no fallback position. Placing all eggs in a thermite carton may lead to slim breakfasts down the road. Figure17(a): A video clip of steel turning to steel dust. (gif) (mov) (avi) (gif) Figure 17(b): Another video of steel turning to steel dust, although CNNs Aaron Brown calls it smoke. 4. 33-ton section of outer wall columns ripped off side of tower. Figure 18(b): What scooped out the middle portion of the building across the street from WTC2? 8. Brown shades of color in the air suggest something odd occurred. Air had pH levels of 12 of a maximum 14. TV and documentary footage changed the color balance to blue to disguise this fact according to Rick Siegel, indicating complicity in the cover-up. Jones asks a question related to high-energy-release phenomena: "Could mini-nukes have been used on the Towers?" He explains, "Hypothesis was raised by someone (not me) [so] we do experiments to find out! (Scientific method)" [pdf (8/15/06) p. 149]. We wonder what experiments Jones did with mini-nukes on the BYU campus. Experimental method aside, it is not scientific to bypass data and set off to disprove a circumscribed hypothesis proposed by somebody (a "bad" person?). Jones claims he tested a metal slag (origin unknown) for radioactivity (what kind? what instruments?) and found nothing above background levels. Residents of New York City reportedly detected abnormal radiation on hand-held Geiger counters at the WTC site, though we cannot vouch for the veracity of these reports. While we too doubt a fission bomb was used, Jones assertions play no role in our assessment. Tritium would be a telltale sign that an extraordinary device was employed on the Twin Towers. Jones says he tested an air sample (origin and preservation technique unknown) and found only traces of tritium. Until independent researchers test verified samples, there is nothing here but Jones word and we leave it to you to decide its value. Jones takes a victory lap ("Mission Accomplished") by saying, "So the evidence is strongly against the mini-nuke idea, which no longer be promoted [sic] unless and until the above compelling evidences [sic] can be successfully overturned" [pdf (7/19/06) p. 150]." Jones did no research that we know of on the Pentagon incident. Most 9/11 skeptics believe no Boeing 757 crashed into the Pentagon because the gash was too small, no plane marks left on the building (airliner silhouettes of passage at the Twin Towers, not at the Pentagon even though concrete is brittle and more likely to shatter and show a planes imprint), no verified debris, no bodies, no blood, it is physically impossible to land a 757 at a speed of 500+ mph because of the downwash sheet, etc. perhaps a B737 rather than a B757 (AA flight 77)" [pdf (7/19/06) p. 159]." went into the Pentagon," Jones persists, offering zero scientific evidence for this hunch. If the hoax of a Boeing at the Pentagon is unproven, nothing about the 9/11 hoax has been proven. "We also seek answers as to why there were no air defenses to stop the incoming jet!" [pdf (7/19/06) p. 160].". With no proof of an incoming jet, Jones assumes OGCT. Jones and the scholars should hunt the Boeing. No fuel burned below gashes of either tower (Figure 22). "Did a faction in the government know about the hijackers pending attacks beforehand?" [pdf (7/19/06) p. 124]." Jones asks. The professor is clueless or a disinformation agent. He refers to pre-9/11 intelligence warnings that are disinformation, thereby echoing the blood libel that 9/11 was done by Arab hijackers. Jones defends the 9/11 Commissions conventional air defense "breakdown" story. It is nonsense to make such statements backing the OGCT without looking at or conducting scientific research on these issues. When Jones defends the WTC airliner story, he cites soft evidence like videos, "many, many eyewitnesses," unverified flight data recorders, an alleged consensus of Scholars (capital "S") in favor of airliners and calls for release of evidence (who but the government could object?). Jones says videos "clearly show the commercial jet liner." Doh! You mean the perps would fake a video and NOT show a jet liner? The question is, do the pixels reflect reality or is the jet liner image inserted? In NFL broadcasts, the first-and-ten line is inserted in real time, as are billboards at NBA and MLB games, even customized by region. At the Winter Olympics, TV trickery inserted the flag of each speed skaters nation under the ice and then switched it in real time as the skaters switched lanes. Truly remarkable. To sketch in a refutation of eyewitness accounts, first, most people in the "canyons" of lower Manhattan could not see a plane if it smacked into a tower at 500+ mph, and many said so. A plane at 500 mph would cover a 60-wide street and its sidewalks within a tenth of second. Second, many witnesses heard no jet and most of the video sound tracks record no jet liner booming at incredibly high speed and low altitude. South tower penetration is silent in videos. Third, witness testimony is notoriously unreliable and fungible. [archived version] Fourth, people lie (the perps hired actors, along with a script for complicit media). Fifth, physical evidence ranks number one with prosecutors and scientists while eyewitness testimony ranks lower, certainly no higher than second. A physics professor should exhibit more interest in physical evidence than hearsay inadmissible in court. Scrutiny of alleged eyewitness testimony, however, may not be entirely worthless. As far as we can tell, there is a dearth of testimony from disinterested witnesses affirming airliner flights into the WTC towers. Consider the first plane that allegedly flew into the North Tower: many thousands of people in Central Park plus northbound drivers, passengers and pedestrians along First, Second and Third Avenues, Lexington Avenue, Park Avenue, Madison Avenue, Fifth Avenue, Avenue of the Americas, Broadway, etc., would have seen a low-flying AA Boeing 767 thundering south/southwest down the island of Manhattan. At high speed it would have been incredibly noisy, extraordinary and scary. It would have echoed down the canyons. The direction or source may not have been obvious at first. At 400+ mph the jetliner would have taken approximately one minute to fly less than seven miles from just north of Central Park into the North Tower, plenty of time for witnesses to see and track a plane go by but not hit the tower. Thousands of disinterested eyewitnesses could have confirmed a Boeing 767 flying overhead if the official story were true but Ive not seen such interviews. The internet lacks credible "street interviews" and the controlled media did not go there. That is a telling fact. probably caught the last 5-6 seconds of flight of the first plane flying straight into the north tower. Impact, fireball and when it hit, it was like, you got like a thud in your stomach, like did I just see what I just saw?" Sure, sure. There is a credible eyewitness statement, right? Wrong. Here's what is wrong: first, CNN offices then were at 5 Penn Plaza on W. 33d street, almost three miles north of WTC, a 10-minute ride, not a walk. Thats not "nearby" by our lights. Second, facing south from an office on the 21st floor sounds good but its not a good vantage point because the plane would fly by in a flash, too fast to get a real fix on what it was. Third, the plane would take over 20 seconds to arrive at the north tower, not "the last 5-6 seconds of flight" claimed. Murtaghs timing is off by an order of magnitude. While hugely effective, Murtagh is not credible. Fourth, CNN led its coverage with a report from one of its own executives about a large airliner flying into the North Tower. They did not even have enough respect for the audience to interview a hired actor on the street, instead putting the lie "in plain view" by broadcasting it from a CNN employee. Fifth, Murtagh is a lousy actor, with a flat, disinterested delivery that no appalled American watching an airliner fly into the North Tower could possibly muster. To our knowledge, Jones passes over the Pennsylvania hoax, the Todd Beamer "Lets Roll" fraud, the absurd "crash site" in Shanksville, PA. We wonder why. Perhaps we should applaud professor Jones for his silence on this issue because he has conducted no scientific investigation. Perhaps the perpetrators did such an embarrassing job and the story is so weak that he found no way to defend it. Yet Jones silence speaks loudly to us because it is so easy to prove OGCT a lie in Pennsylvania. The professor might want to start his search with Hunt the Boeing II. Figure 26(a): Smoking hole near Shanksville, PA free of plane debris, bodies, luggage, etc. A local resident observed, "Its the only place it could have gone down and be sure no one would be hurt." Translation: it was the only place where there could be no witnesses. According to media reports, no local resident claimed to see a plane crash. Figure 26(b): For national security and privacy reasons, the government has not yet shown this evidence of the Shanksville plane crash J . Perhaps Professor Jones most disturbing offense is failure to verify his data and show reproducibility in his experiments. The origin of his evidence is shadowy, chain of custody unknown, and materials and proof for the testing processes undocumented. Just like the 9/11 Commissions methods, much of Jones so-called evidence is "self referential," that is, it is a closed loop of alleged results inaccessible and therefore unverifiable by outsiders. It is the "trust me" approach. Jones champions peer review yet he has never presented his 9/11 paper at a scientific conference despite at least one invitation, and his journal is not peer reviewed by scholars in the same discipline. Given Professor Jones enormous popularity in the 9/11 arena, we must undertake the unpleasant task of social analysis. Jones "evokes" the persona of a choirboy and he plays to the gallery. Here is evidence: over half of his slides have no connection with physical science, and instead are political. In effect, they proclaim, "Elect Steve, I wanna be your physicist, Im a NICE guy." The clutter in Jones presentation ranges all over the map: Jones proudly points to "growing investigative support at BYU" [pdf (7/19/06) p. 44], a sympathy-soliciting but phony-sounding email threatening negative consequences and promising bribes (Im a victim, Im courageous), crowdpleasing calls for investigation/impeachment, paeans to phony peak oil crises and fragile infrastructure, denunciation of corporate profits (he is a conservative [pdf (7/19/06)] and corporate profits are bad? Corporate losses are good? ), solar cookers, shared values, the Prophet Nephi and other irrelevancies. Does anyone really care what a physicist says about Nephi, the U.S. Constitution, pre-9/11 intelligence warnings, Able Danger, or an alleged insider sell-off of Raytheon pre-9/11? He even gets his economics wrong here because a pre-9/11 "buy-off" of Raytheon would profit insiders as defense contractors share prices would soar with the forthcoming "war on terror." Excusable error for a physicist perhaps but bad physics and use of his authority to pronounce in fields where he has no expertise are not excusable. All would be forgiven if he offered insights or revealed hidden truths, but he does not. As 911eyewitness creator Rick Siegel said in mocking Jones and his thermite diversion to explain missing towers, "Of course it was WMD, why else [call in] an educated nuclear physicist promoting solar cookers?" Critics may claim that we damage Scholars for 9/11 Truth by exposing failings in the work of Steven Jones, who has been thought of as the leading physical scientist. Yet the Scholars are "dedicated to exposing falsehoods and to revealing truths." S9/11T is devoted to applying the principles of scientific reasoning to the available evidence, "letting the chips fall where they may."